197 ? (Early Series) Wide bowl, dimpled, square mouth. Does this shape appear in other series? Yes, probably, judging by the shape-book sketch - Pamela 14. 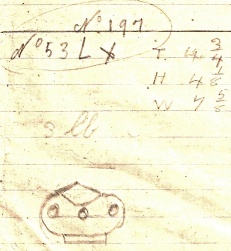 Dimensions; from shape book, height about 9.5 cm, diameter about 18 cm. Possibly the Early Series 197 shape? For a close-up of a Pamela sticker see Pamela 1.